Could this be the first £50 Windows 8.1 tablet? How low will Wintel go? Pictures and details of what looks like one of the cheapest (if not the cheapest) Windows-based computer (let alone a tablet) ever launched have surfaced online on the forum of one Chinese tablet manufacturer (via Mike Canex). 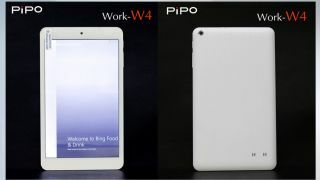 The Pipo Work-W4 looks like a bog-standard Windows-based, Intel-powered tablet that is expected to cost RMB 499 (about £49, $81, AU$92). Arguably, these prices do not include value added tax and probably not delivery. A spokesperson for the company said that the new model is still "a concept" and they are thinking of changing the specs of the existing, more expensive Pipo W2. What we do know about is that it will have almost the same hardware bar the onboard storage (16GB, rather than 32GB) and the system memory (1GB rather than 2GB). The layout of the cameras and speakers indicate that the Work-W4 is best used in portrait rather than landscape (which is the case for the W2). It will almost certainly run on Windows 8.1 but we're not sure whether it will come with an Office 365 subscription like the W2. Since it carries the Work moniker, I believe it is highly unlikely since the Office 365 Personal license forbids a business usage.